Brew day number two is all over; nothing more than a memory and some notes on a piece of paper. I decided to go the route of making my own recipe for this one to feel that I was in a little more control. I ended up with 2.5 pounds of grain that I steeped, adding 5.4 pounds of pale dried malt extract (DME) and a half pound of lactose. The lactose, half the DME, and 1 ounce of hops were added at boil. 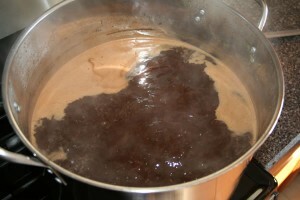 I added eight ounces of Hersheys cocoa with 10 minutes left in the boil. By now you probably realize that Pot Licker is a milk chocolate stout. free run 3.0 v4 I hope there is some bitterness from the hops, malt, and chocolate while the sweetness from the malt and lactose balance out, hopefully even slight creaminess. Unfortunately it will be February before the beer is ready. I hope it is as good as I imagine it to be. Enjoy! 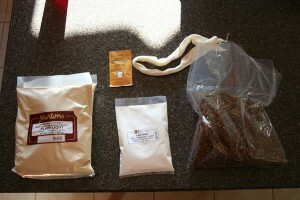 This entry was posted on Monday, November 30th, 2009 at 4:30 pm	and is filed under Home Brewing. You can follow any responses to this entry through the RSS 2.0 feed. Both comments and pings are currently closed.